Before you read this post. Choose a card. Remember it. 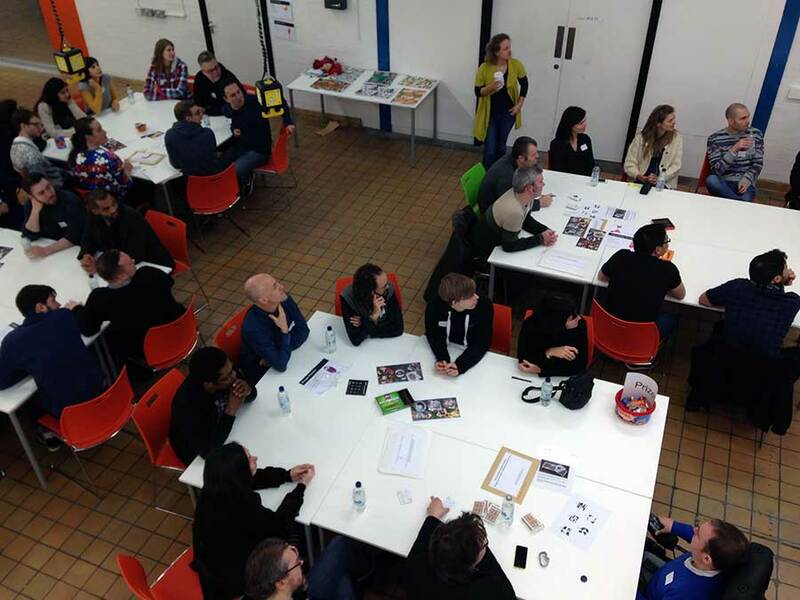 In December 2014, just before Christmas, the UXA team at the BBC took on the challenge of convincing 120 UX designers that they all make information architecture. IA is a specialism. 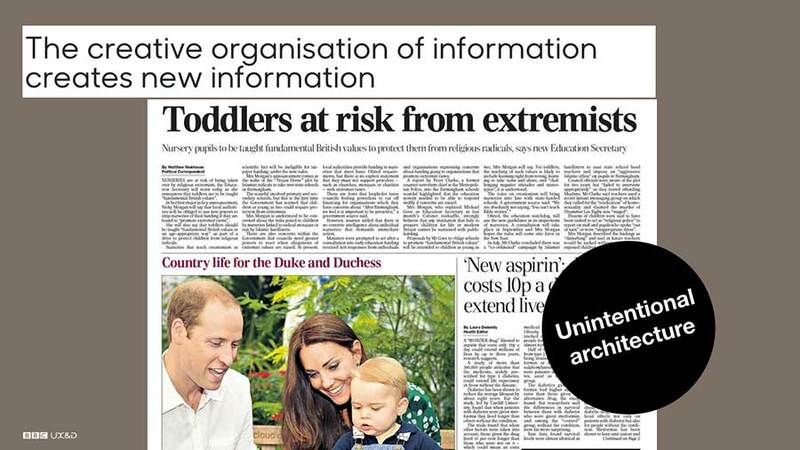 But it also underpins all user experiences. I wanted to give UX designers the confidence to consider IA more in their day-to-day work, and to ask IA questions when things get tough. This is how we did it. The 12 days of Christmas is a stupid song. It’s stupid for lots of reasons. But the main one is that it promotes an entirely inefficient present-giving strategy. There’s too much repetition. On the first day of Christmas the gift-giver gives a partridge, and presumably also the tree in which it sits. Then things start going wrong. Day two brings turtledoves. But I imagine that the partridge and tree combo of Day One was met with such enthusiasm that the gift is given again. And again, each day sees the same list of gifts re-given so that by the end of the song the gift-giver has gotten rid of a total of 364 items. The system is inefficient, ostentatious and requires the relocation of at least 12 trees. Even the best gifts on the list – five gold rings – is deeply flawed. OK, you’d end up with 40 rings. But who has that sort of finger space. You’d be walking around with the hand equivalent of Mr. T’s neck. So the song is stupid. But it got me thinking. 364 is an intriguing number. 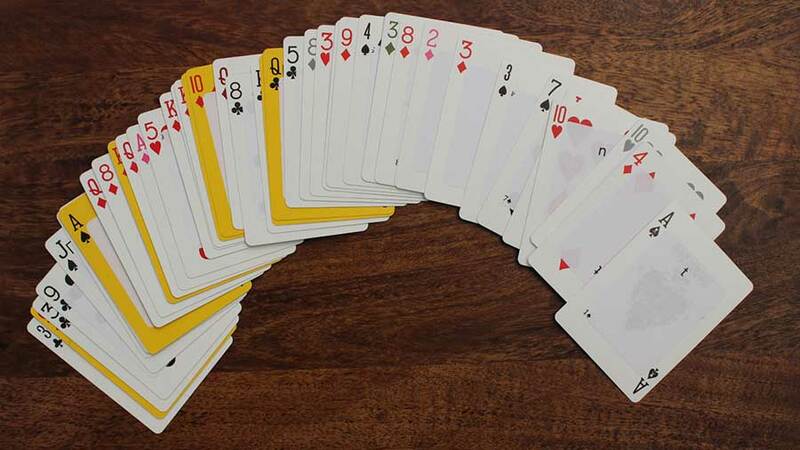 If you add the value of all 52 cards in a deck of cards it adds up to 364. And if you start shuffling a deck of card, you quickly become aware of the complexity of things when systems start to grow exponentially. This was my inspiration for teaching 120 designers that everyone makes information architecture, and unless you consider the impact that your decisions have on the interplay between elements, you can create systems as ridiculous as that gift-giving one from that stupid Christmas song. The day started with a controlled vocabulary of cocktail ingredients. As the team arrived we had each one take a name label with a drink on it. Name labels are great. We’re a team of over 120 and we work across lots of sites. Not everyone knows one another. Sometimes a colleague is just a name attached to an email. But name tags quickly jump you to connecting those names you exchange email with to the faces that stare at the emails as they’re being written. Once everyone was settled and labeled we established the premise for the day – everyone makes IA. The world is made of information. That email, collected into inboxes, nicely ordered desktop items, Photoshop layers, shopping lists arranged in aisle order, nicely labeled Christmas gifts – we all do IA. Designers especially make IA. Websites are made of information. We create virtual places made out of information. 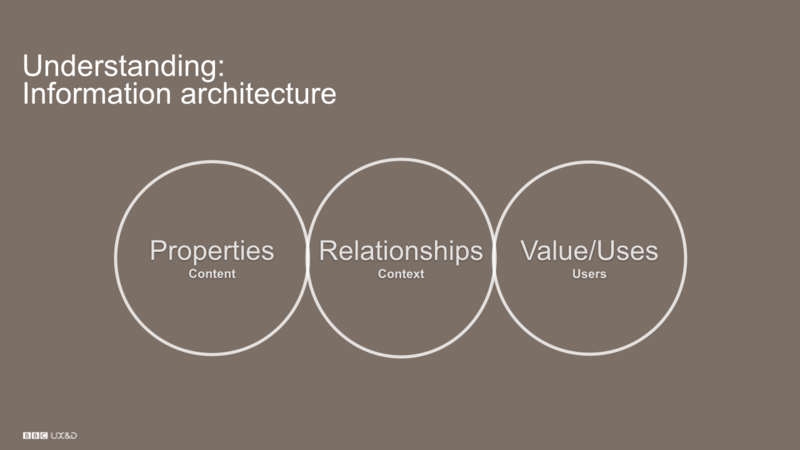 Whenever a designer creates something that connects and forms structures, they create information architecture. But although information architecture always exists, its sometimes not been part of the conscious design process, it’s the consequence of other design decisions. Not only is this dangerous and can result in unintended consequences, but it also represents lots of missed opportunities to make things that are more meaningful, efficient, connected and resilient. Good, early, conscious IA thinking can free up time to make better stuff – we just need the confidence and the skills to all think a bit more like IAs from time to time. So how do you boost that confidence and highlight some of the ways that IAs think? The obvious starting point is alcohol. People who work in bars are awesome information architects. They’re brilliant at labeling and categorizing things. They think about workflow, efficiency and metadata. So where better to start? We got everyone together and asked people to move around, and use the information on their name stickers to collect themselves into groups that added up to 100% alcoholic volume. It’s simple IA. It’s collecting stuff together based on one bit of metadata. It gave a good introduction but it didn’t give us any control over the size of the groups. So we introduced a second round. 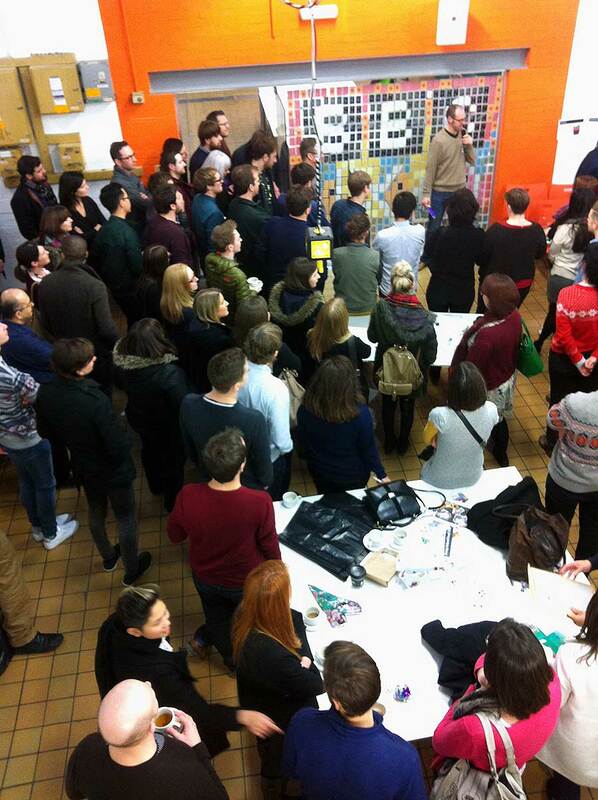 We asked people to rearrange themselves into cocktails. We called forward the first ingredient from each of 24 drinks and asked them to track down the other ingredients from the group. 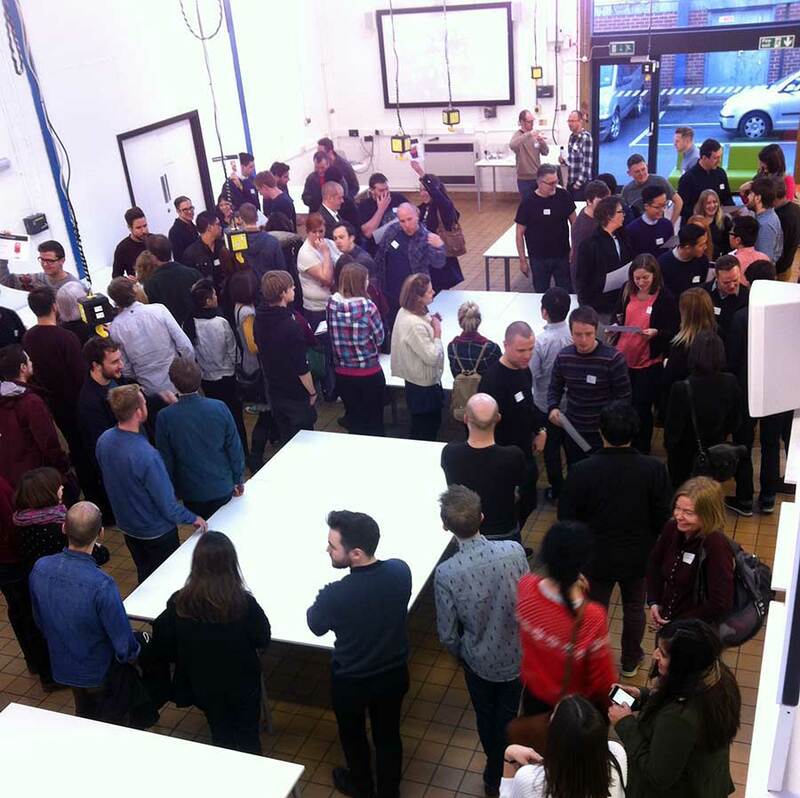 We then formed teams of two cocktails each, starting the day with 120 people, 120 stickers, 24 cocktails and 12 teams for the rest of the day. For getting into their teams we gave each group a pack of cards. It was both a prize and a challenge. The deck of cards was there to unlock the secrets of the rest of the day, and prizes. We had a box full of goodies which we’d locked with a padlock, we had some keys and envelopes to contain them which would act as other prizes, later in the day. 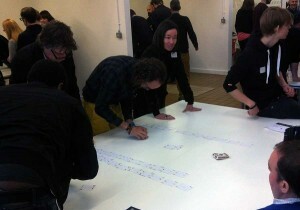 We had a UV torch and some coded envelopes that each team could claim if they cracked the cards code. They’d need to focus on the cards to know what do next next. 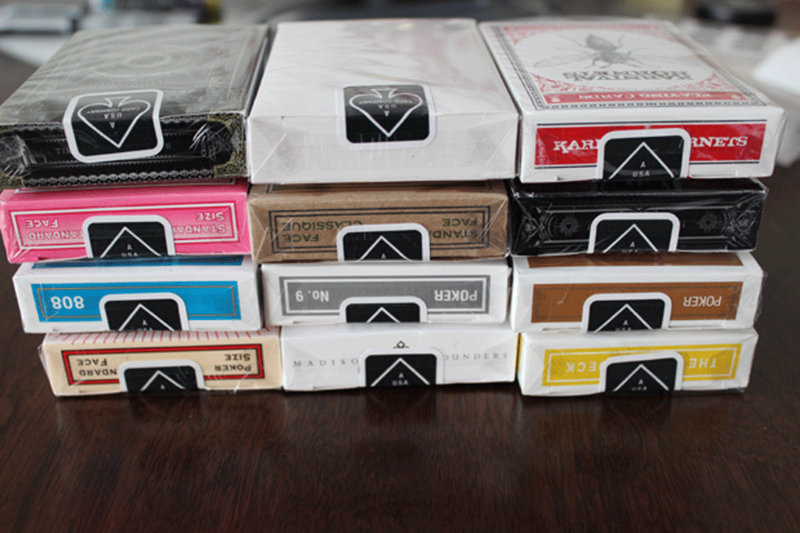 There were 12 different decks. They looked pretty normal. They weren’t. We’d taken the cards from all 12 decks, labeled them and then mixed them up. We explained all about Shrieks and told the teams that they had to arrange their deck in a specific order. 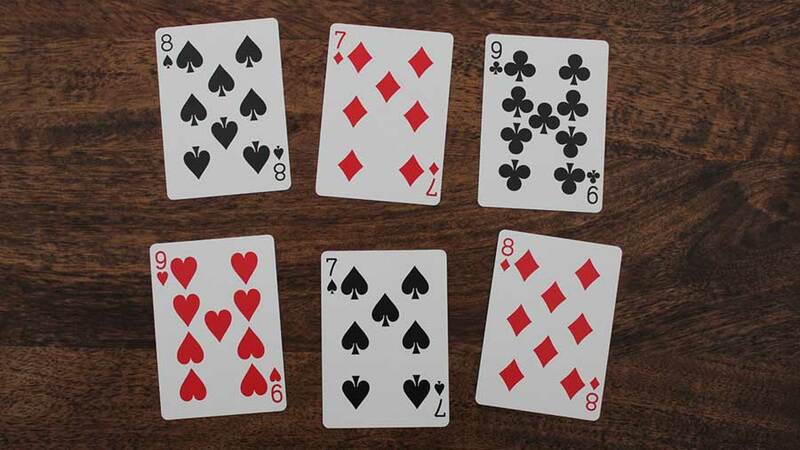 Once it was in the right order the labels on the front of the cards would spell out a code that matched one of the envelopes and the team would have won their second prize. If they hadn’t been thinking like IAs they might have started shuffling and hoping. But they didn’t. We started by describing everything we knew about cards. They described the values, that a deck was made up of 52 cards, and as soon as I let them open the boxes they added that cards had different back designs and codes on the front. By understanding the content we started to build a brief. 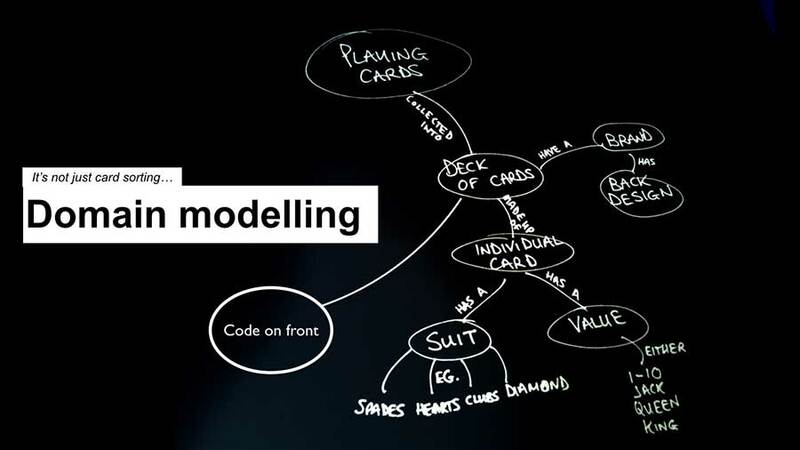 We’d created a domain model. And each team realised that they needed to clean up the mess I’d made, collecting all 52 cards that matched their box and then arranging them in numerical and suit order. The room was soon transformed into a trading room floor, people shouting and waving wildly the cards that they had to swap. This was perfect, fun and energetic as the team brought to life the interaction and ad hoc transactions of real information systems using their little, portable bits of information. By the end of the morning we had 12 complete decks of cards, each with a 52-letter code that matched one of the 12 coded envelopes. The envelopes contained quiz questions and answers – that’s what we needed after lunch. IAs often look for answers and what better way to get lots of answers than ask lots of questions – a quiz seemed perfect. We asked 52 questions and told the teams to add their answers onto their cards, using the code label which still had plenty of space on them. Each question related to one of the card, and there was room on the label with the code letter for them to write their answer. We asked the questions and the teams tried their best to answer them. Then we gave them the answers. This is temporary image. The real pockets had labels with the answers on them to indicate which pocket to put which card in. 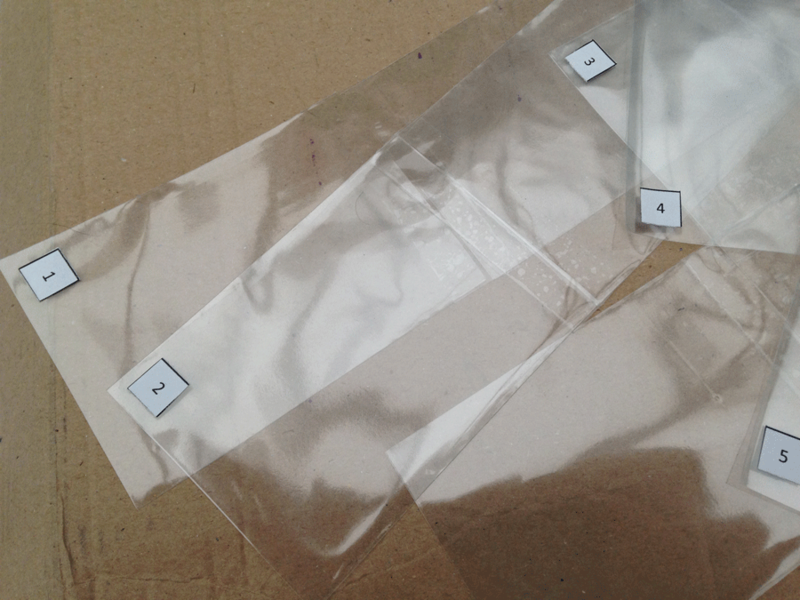 The answers were also printed on stickers and the stickers were stuck to plastic wallets, numbered and cut into a range of shapes. As we ran through the answers with the teams they slotted their card into the matching wallet and got ready for the end of the day. So far each team had 52 answers, they’d got some right and some wrong but each team got a prize. These prizes were useless. IA is sometimes complicated stuff. We spend a long time understanding and organizing things. But if we’re not able to put this thinking into action it doesn’t truly become useful. 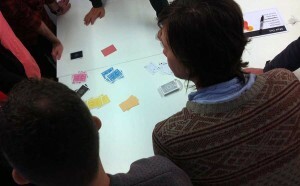 We’d thought about content and properties when we’d sorted and swapped cards. We’d thought about relationships as we’d connected answers to questions. But now we needed to make this meaning useful. We’d done two of the big three in IA. But now we needed to make things useful. Each of the answer sheets had numbers printed on them. 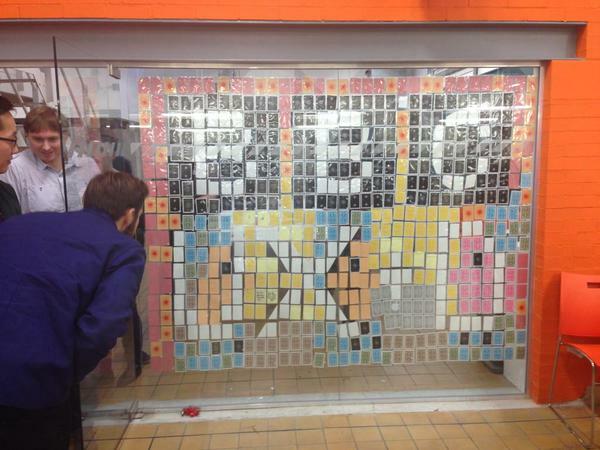 We’d secretly spent a little time in the morning sticking 182 matching numbers to a nearby glass wall. This is another temporary image. It was taken at the test stage. 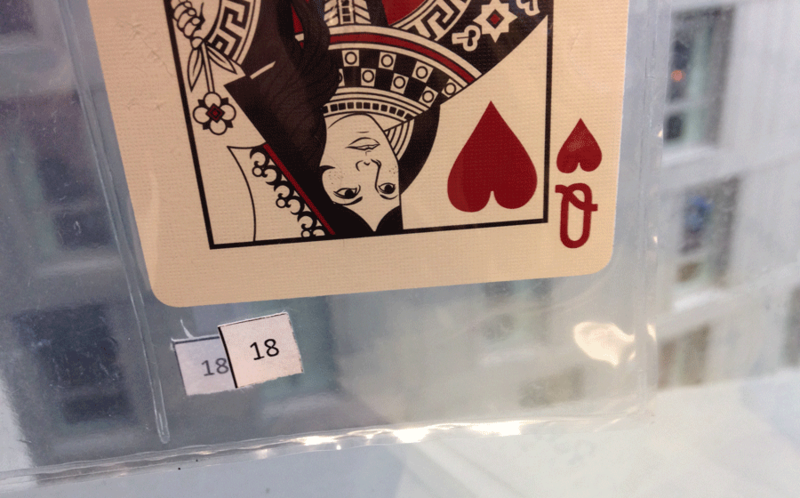 The actual pockets had another sticker with the answer to tell the teams which card went where. Now we matched our answers to the template that we’d created. It all came together 624 cards, 182 locations, 182 shapes, 896 glue dots, 120 designers and two-sides to a window. Information architecture is sometimes a bit of an invisible art. There’s lots of thinking involved. And thinking is invisible. An IA recommendation can sometimes feel a bit like magic; you know it works, but the actual reasons and method remain a little inexplicable – unless we work really hard to communicate with clarity and commitment. I think as a discipline we need to get better at making the magic of IA more visible, and inviting more people into the process. 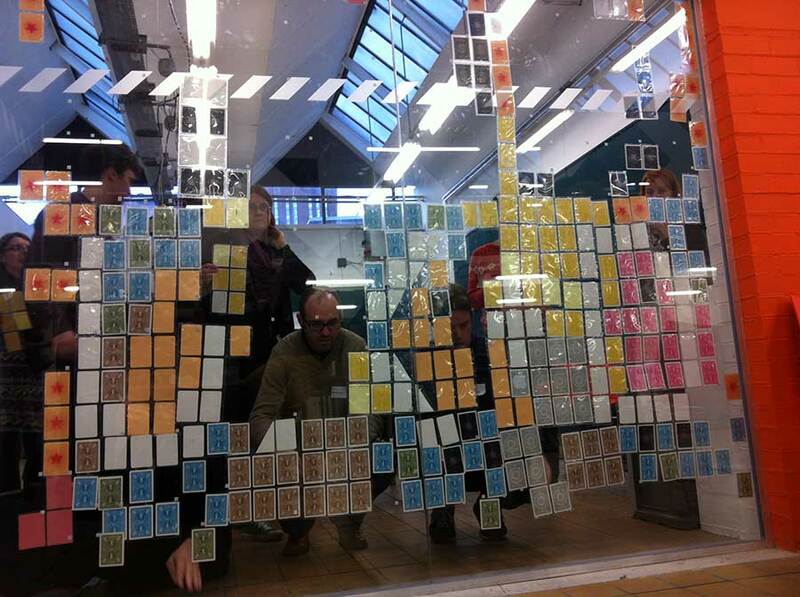 Part of the big, pixel-art-like collage that we created were six two-part post it note messages with instructions of which key opened the prize box. Of course, it wasn’t that straightforward. Each half of the 2-part message was written in UV pen, and finally the seemingly useless UV torch prize made sense. It cast light on another part of the process and made the design even more useful. Everyone makes IA, and pretending that it’s too complicated to care about isn’t really a very good reason for not thinking about it. 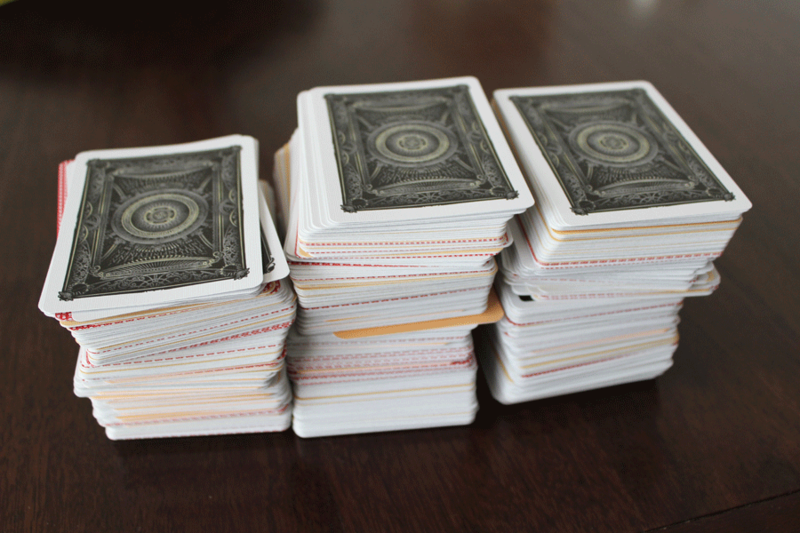 IA can be done by anyone, even when it involves masses of information and variables (120 people, 624 cards, 181 shapes and locations…) You just need to take your time, use some tricks of the trade, work methodically and work as a team. 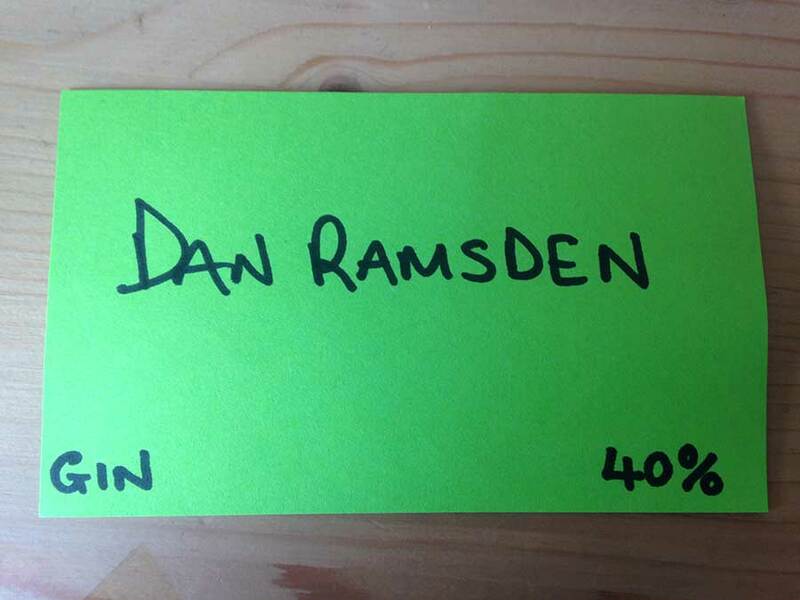 I had a brilliant Christmas, knowing that I’m a member of one of the best UX teams in the world. 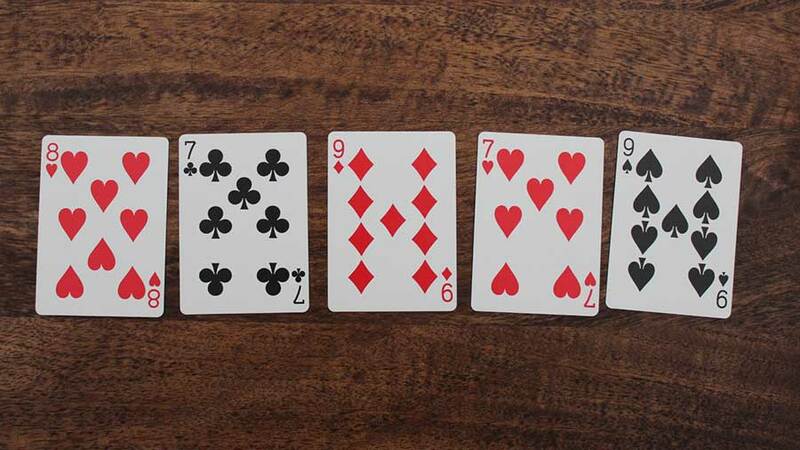 If you’re still with me, you chose a card at the start. Given that you’re the kind of person that would get the end of a post like this, I think I can probably be confident in claiming to have removed your card, below.